Donald Frazier, author of the ongoing “Louisiana Quadrille” series published by State House Press, is on the verge of releasing volume 3, Blood on the Bayou: Vicksburg, Port Hudson, and the Trans-Mississippi in late February 2015. I’ve said this before, and it bears repeating. Frazier is doing for the Civil War in Trans-Mississippi Louisiana what Gordon Rhea did for the 1864 Overland Campaign in Virginia. The difference is that these battles, many of them mere skirmishes when compared to their Eastern counterparts, are often being covered for the very first time in book form. 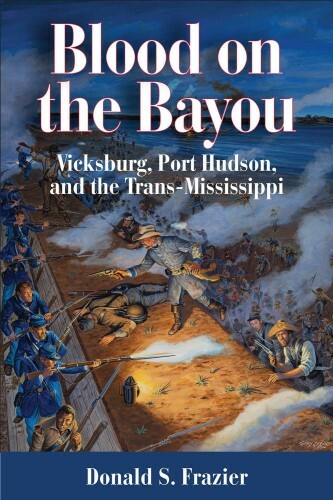 Blood on the Bayou: Vicksburg, Port Hudson, and the Trans-Mississippi covers the war in Louisiana from June 1863 to February 1864. A major theme of the book, mentioned directly by Dr. Frazier in the Foreword, is slavery, slaves (current and former), and what to do with these thousands of newly freed people as the contending armies moved back and forth across Louisiana. More importantly, writes the author, the Union and Confederate authorities seemed obsessed with who physically controlled these people. Unfortunately, many former slaves don’t fare well in this book, particularly after Nathaniel Banks abandoned 10,000 of them at Brashear City while he was busy reducing Port Hudson. Another major theme of this book concerns the twin sieges at Vicksburg and Port Hudson. Frazier doesn’t cover these well-known operations directly, because his focus is the Trans-Mississippi. But all of the operations in Louisiana west of the Mississippi River, especially Confederate initiated operations, were preoccupied with how to help the Confederates trapped against the river by Grant and Banks. Walker’s Divisions assaulted Milliken’s Bend in part because they thought Grant still had supplies west of the Mississippi near Vicksburg. Richard Taylor launched various offensive incursions, including the wildly successful capture of Brashear City and the aggressive threatening of the Lafourche District, New Orleans and the Mississippi River, in an attempt to cause Banks to “blink” and move away from Port Hudson to protect New Orleans. Banks failed to take the bait, and soon came after Taylor’s men himself once Port Hudson was reduced along Bayou Lafourche. After a sharp check at Kock’s Plantation, the Port Hudson veterans failed to pursue. However, the U. S. Navy tried to trap the Confederates near Brashear City and Berwick Bay, but without success. Most of the book covers battles and movements during June-July 1863 as a result. The time period from August 1863 to February 1864 is covered near the very end of the book. The massive reversal of Confederate fortune led many Southern sympathizers in Louisiana to evacuate form their homes, slaves in tow, to northeast Texas. Kirby Smith was forced to maintain an army and act as the de facto Confederate government west of the Mississippi River. The number of illustrations and maps in this book are simply amazing. Kudos to the author and State House Press for cramming Blood on the Bayou chock full of these visual aids. Readers unfamiliar with Louisiana geography and climate will quickly become acclimated as a result. The book contains 35 maps, including multiple maps on specific battles and skirmishes, showing how the fighting progressed. Many of these maps go down to the regimental and even company level. War gamers will find an array of interesting fights which could be easily gamed on a miniatures board or using various computer games with scenario builders. Blood on the Bayou: Vicksburg, Port Hudson, and the Trans-Mississippi, Frazier’s third book of a planned four in the Louisiana Quadrille series, is more of the excellent same while also moving in an unexpected direction, both for the author and the reader. The result is a blend of excellent tactical battle history and well as a new focus on the beginning of the end of slavery in Louisiana. Look for a full review of the book by Ned Baldwin in the coming weeks, followed by my own review a little later. Go buy this book and the first two books in the series, Fire in the Cane Field: The Federal Invasion of Louisiana and Texas, January 1861-January 1863 and Thunder Across the Swamp: The Fight for the Lower Mississippi, February-May 1863. Frazier is one of the best Civil War authors you’ll read, seamlessly blending official reports, personal reminiscences, and a multitude of images and maps, many from his own personal collection. Publication appears to have been delayed; at least I have been notified that shipment of my book is delayed. Thus my expected review will be delayed as well.